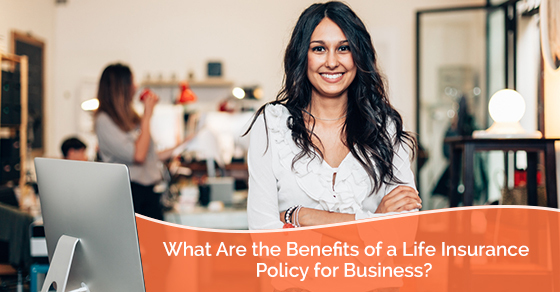 What Are the Benefits of a Life Insurance Policy for Business? Planning for the grimmer things in life – such as death – is easy to put off. Put it off too long, however, and one day it will most definitely be too late. Being a successful business owner requires constant planning ahead. Entrepreneurs quickly become used to the idea of their company being an organism, one that grows and evolves into an entity unrecognizable from its early days. Core missions change, co-owners and stakeholders enter the picture, and contingency becomes a very real concern. After all, Apple continued to grow and thrive when Steve Jobs died in no small part because of thorough planning for how the company should carry on. Steve Jobs may have had billions in the bank, but chances are, you’re not quite there yet with your business. That’s why life insurance is so important for entrepreneurs who wish for their businesses to continue growing and thriving in their absence. There are few things that require such shelving of the ego as planning for the success of something you started for days when you won’t be there. The death of a business owner can be devastating, however, and without the right policies in place, your legacy could be one of failure and anguish for your colleagues instead of perseverance and prosperity. The main reason for investing in life insurance is to protect those you leave behind. Unless you want your business to cease existing the moment you die, a life insurance payout can be the very necessary lifeblood that allows your business to remain operational. Opening and growing a business is a painstaking task, one that absorbs an entrepreneur’s life, their waking thoughts, and their dreams for the future. The thought of it shuttering unceremoniously following a tragedy is not what most owners project for their business. For the sake of its legacy and yours, investing in life insurance is a must. Life insurance isn’t just advantageous when you die; it can be very beneficial as an asset while you’re alive. The value of a permanent life insurance policy grows over time and is not taxed at the same rate as other corporate investments. This means more money in your bank account and an intelligently diversified portfolio. One of the main reasons business owners invest in life insurance is so there is money to tide the company over while ownership changes. If you’re one of several owners, then your position will need replacing. A life insurance payout allows your business to continue issuing paychecks and placing orders while the board figures out the best course of action to fill the key role you played. No one likes talking about their own death. It’s creepy. It’s a downer. It’s not part of the entrepreneur self-help books that proclaim all you need to do is believe in yourself and change the world until someone in one of those weird cults offers you an invite to drink the elixir to life. A responsible business owner puts their pride, and their fears, aside for the best interest of the company and all the people involved in it. It’s important to have a plan in place so your predecessors aren’t left scrambling to make decisions and salvage their livelihoods while having to grieve you as well. Being able to talk about this subject matter is a sign that you’re a mature, self-aware business owner. Along the same vein, your employees are highly vulnerable to major changes in the company. There could be massive layoffs if an owner dies, and if the company folds, then everyone is out of work. It’s a poor way to repay your employees for giving their all to your company. After all, no company can succeed and grow without people at every level. A life insurance policy means that despite confusion and structural changes, your employees won’t be put in a perilous position. When layoffs hit the news, it becomes even harder to salvage the remains of a company. Better to not let it happen in the first place. A life insurance policy does not have to be expensive. Whatever the amount of coverage you need, a broker can discuss implications and rates with you so you create a policy that offers what you need without draining your bank account while you’re still breathing. While your policy is an appreciable asset, there may not be enough liquid cash to put towards it without harming other facets of your company. The good news is you can still get coverage without unbalancing your budget. If you want your company to survive you, life insurance is a must-have. It protects your company, the people who have become your work family, and lets you do more with your assets. Contemplating life insurance doesn’t have to be spooky and morbid. When you look at all the benefits, you’ll see that life insurance can actually give you greater peace in the precious moments we have. Don’t delay protecting yourself, your loved ones, and your business. Get in touch with W.B. White Insurance and learn how we can put you in the best position possible for future success. Call us at (905) 576-6400 or contact us here today.